He obtained his BA in physics from the Johns Hopkins University, his masters in business administration from the University of Chicago, and his Ph.D. in systems science from Portland State University. LaViolette has authored seven books: Subquantum Kinetics, Genesis of the Cosmos, Earth Under Fire, Galactic Superwaves and their Impact on the Earth, Decoding the Message of the Pulsars, and Secrets of Antigravity Propulsion. He is also editor of a book of essays by Ludwig von Bertalanffy entitled A Systems View of Man. He has also authored numerous technical papers as well as several magazine articles on a variety of subjects, systems science, physics, astronomy, cosmology, SETI, aerospace propulsion, geology, paleontology, educational psychology, stock market theory, and solar energy. He speaks at universities and symposia around the world about his research findings. He also holds patents on a novel breathing bag system for closed-circuit breathing apparatus. LaViolette has served as the president and director of the Starburst Foundation since its founding in 1984. The Starburst Foundation is a nonprofit scientific research institute carrying out research in physics astronomy, cosmology, climatology, geology, and alternative energy. A listing of the institutional affiliations of people requesting information on Starburst's research (as of 1988) is posted here (affiliations). 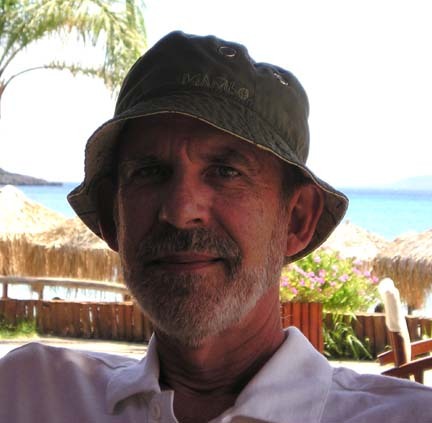  LaViolette is the developer of subquantum kinetics, a novel approach to microphysics. It is the first unified field theory to propose an omnipresent, open, reaction-diffusion system as the substrate for physical existence (matter and energy). It not only accounts for electric, magnetic, gravitational, nuclear, and weak forces in a unified manner, but also resolves many long-standing problems in physics such as the field singularity problem, the wave-particle dualism, and the field source problem, to mention a few. Among other things, it accounts for galactic core explosions, supernovae, stellar pulsation, the electrogravitic propulsion phenomenon, and leads to a continuous creation cosmology that effectively replaces the big bang theory. Subquantum kinetics was also the first microphysics methodology to incorporate general systems principles similar to those applicable to living systems. The theory is also compatible with the process metaphysics developed by Alfred North Whitehead. 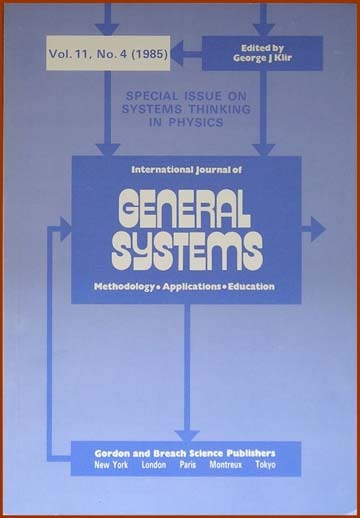 In 1985, the International Journal of General Systems devoted an entire journal issue to the theory's exposition under the title "Special Issue on Systems Thinking in Physics." 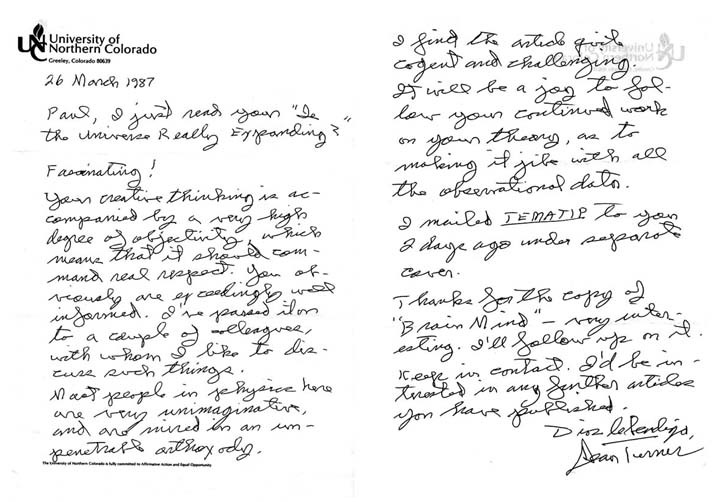 The March 3, 1986 issue of the Brain/Mind Bulletin published a favorable article about LaViolette's theory. 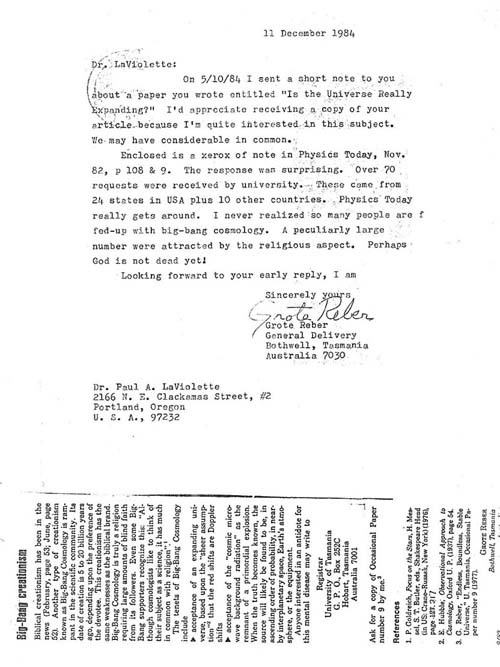 Scientists from around the world requested that LaViolette send them a reprint of this issue: a partial listing of names of scientists requesting reprints. Dennis Pakula makes extensive reference to subquantum kinetics in his excellent book New Story, New God where his discussion of the nature of the physical universe and its ultimate spiritual nature draws heavily upon the subquantum kinetics paradigm.  LaViolette is the first to show that the tired-light, stationary universe hypothesis fits cosmological test data better than the big bang, expanding universe hypothesis, on four different cosmology tests. The results of this test confirmed a key prediction of his subquantum kinetics physics theory (SQK Prediction No. 3). He published his findings in the February 1986 issue of the Astrophysical Journal. 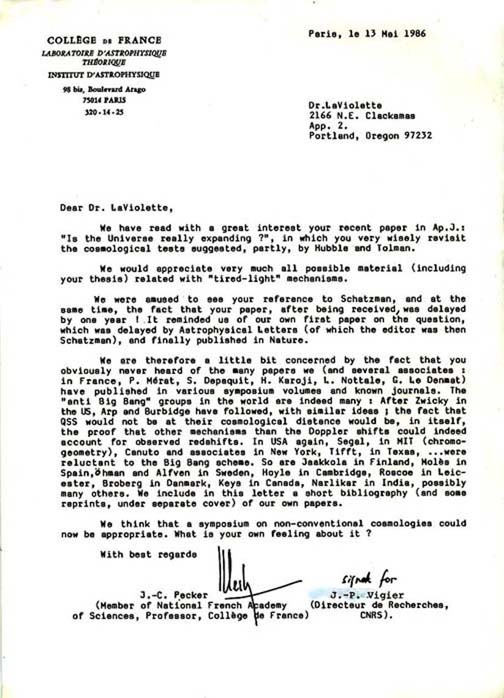 His paper received mention in the August 1986 issue of Astronomy Magazine. 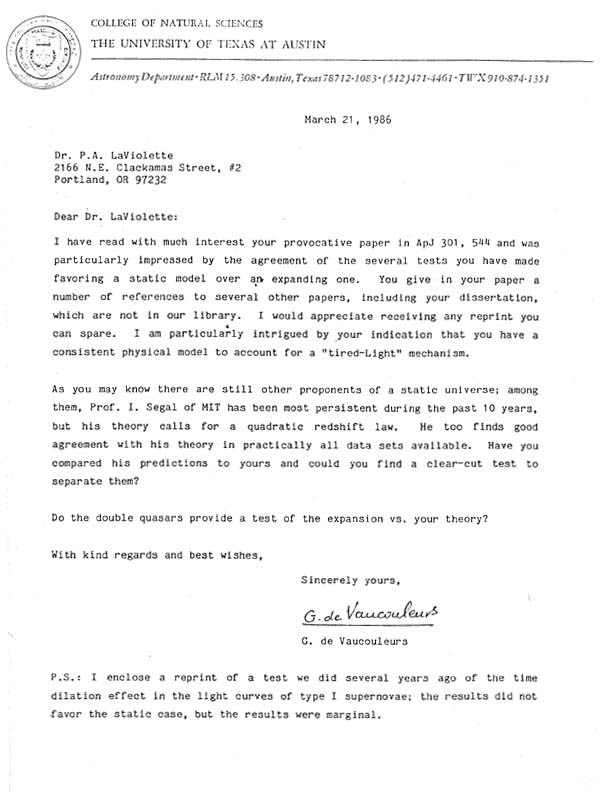 This was considered a landmark paper by many astronomers opposed to the big bang theory. 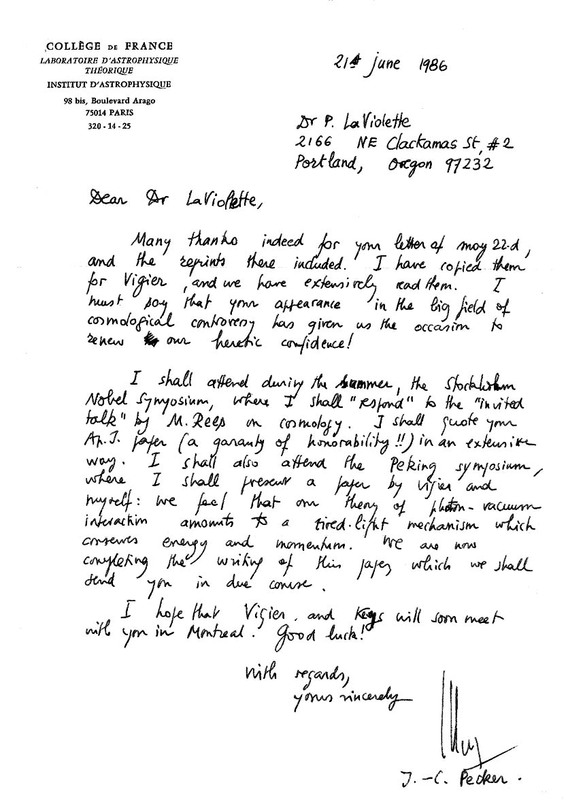 Examples include Grote Reber, the father of radio astronomy (letter), J. P. Vigier, professor of physics at the Henri Poincare Institute, Director of Research at CNRS and Louis deBroglie's former lab assistant (letter, letter),[11, 12] Jean-Claude Pecker, professor at the College of France and member of the French National Academy of Sciences, who wrote that he was to mention LaViolette's paper very favorably at the Nobel Symposium in Stolkholm and at the Bejing Symposium (letter, letter),[12, 13] Georges de Vaucouleur, a well known astronomer and professor at the University of Texas at Austin (letter), Paul Marmet, a member of the National Research Council of Canada (letter), and Dean Turner, professor of physics at the University of Northern Colorado (letter). Up to the present date, 20 refereed citations have been made to this paper. For 15 years this paper stood unchallenged. 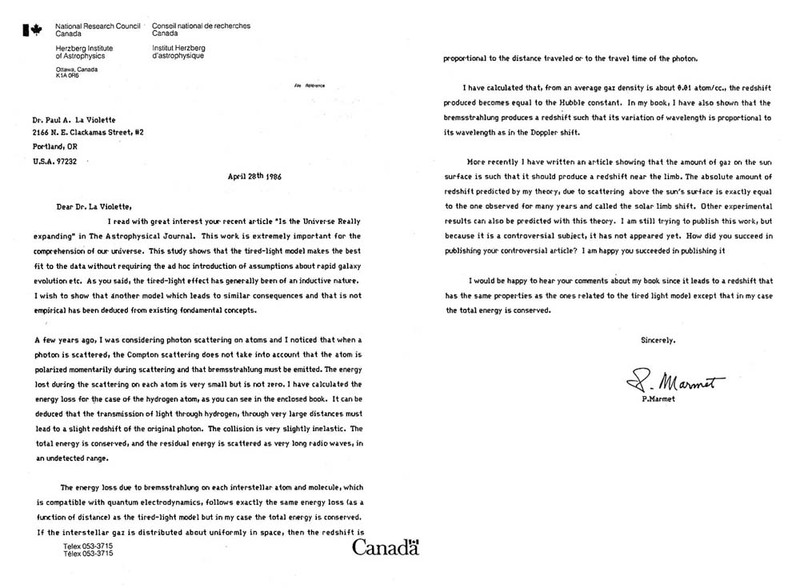 Then, in 2001 two studies were published claiming to present data that refuted the tired-light model. 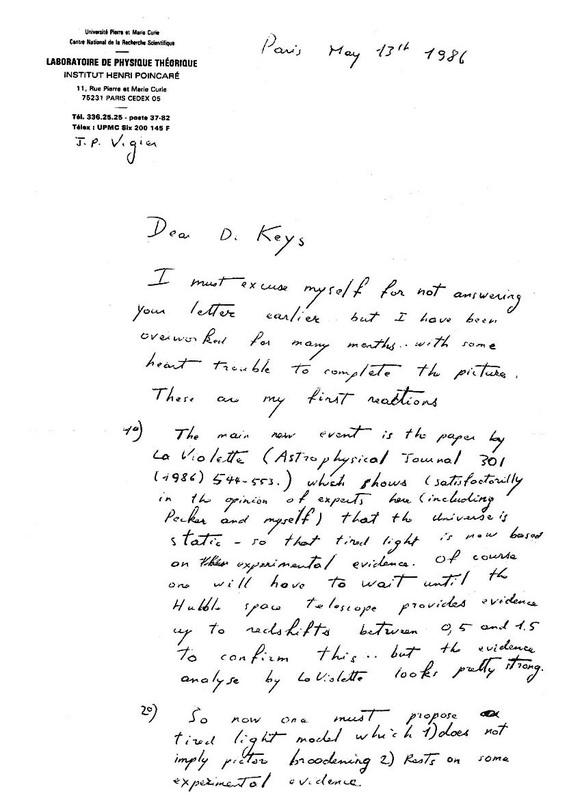 However, in the 2003 update to his book Subquantum Kinetics, LaViolette subsequently showed that the data of one of those studies, the Tolman test, actually confirms the tired-light model and that the second study, which is based on the duration of supernova light curves, is flawed due to the presence of data selection effects.